Nothing like a finish on a Friday, right? I’ll admit this has been finished for a while, I just dragged the chain on taking some photographs. 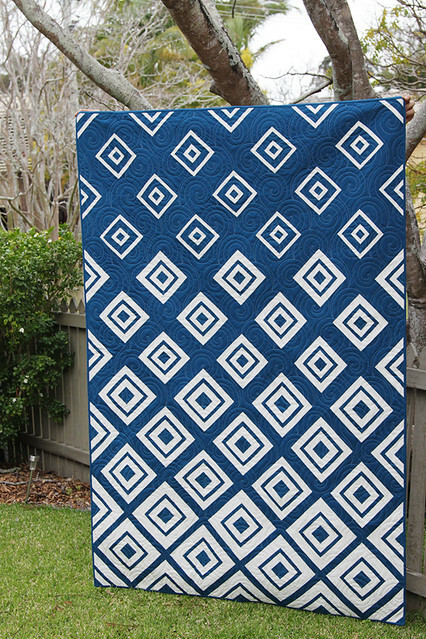 Luckily my resident tall person helped me out so that I can show you my lap-sized Diamonds in the Deep quilt (pattern can be purchased here). This quilt marks the first time I engaged the services of a long arm quilter. I am extremely fortunate to have the lovely Quilt Jane living 20 minutes drive from me! 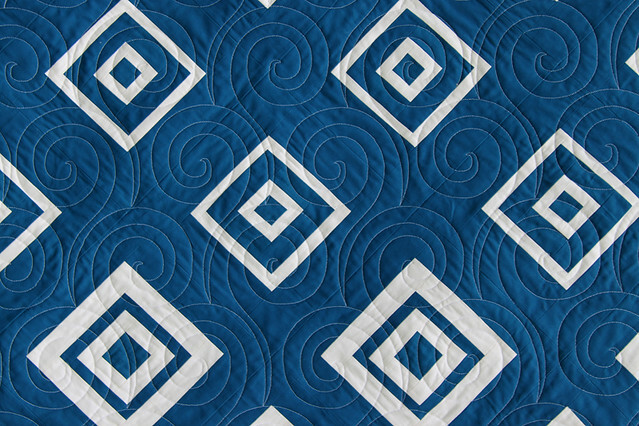 She tested a few different patterns before settling on a swirl that works very well with the water theme of the quilt. 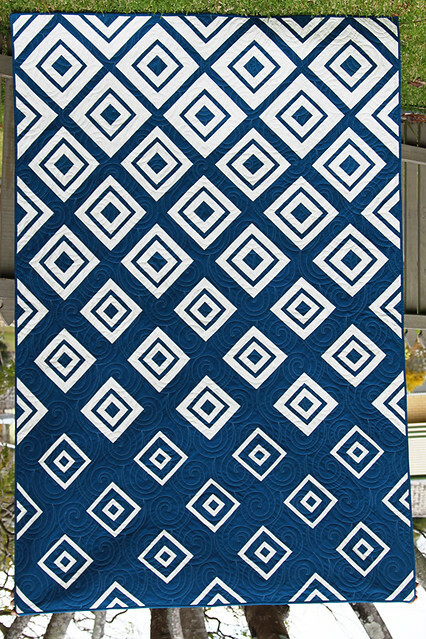 All-over quilting will add a new dimension to this quilt as it will always show quite clearly at one of the ends – there’s really no way to find a thread that will blend into both fabric colours. I love the effect and thank Jane for her wonderful contribution to this quilt. Wow it’s beautiful! So striking and I love the ocean theme. What a beautiful quilt! I ove this design and your colours. The quilting makes it even more beautiful. Congrats with your finish. Another triumph Kirsty! I love this one even more than the original, if that is possible! 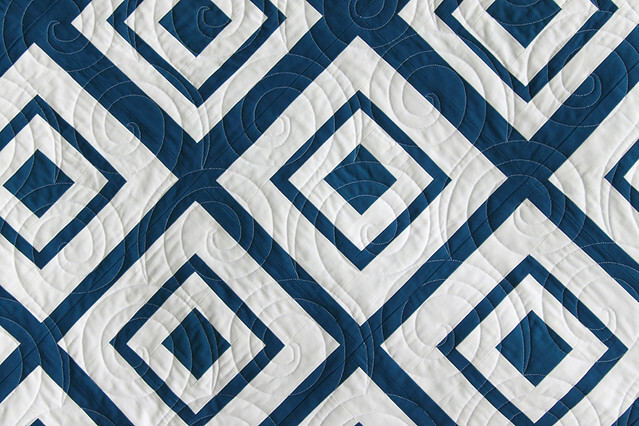 I love the swirly quilting which contrasts so beautifully with the strong geometric design! And yes, I do have a finish to share…. absolutely stunning! Need to add that to my list. Wow, what a stunning quilt. It truly is a work of art! Pinned. This is a work of art! Great design and quilting. Tutorial or pattern coming? Absolutely stunning Kirsty. I love the striking colours on this one. Jane’s quilting is perfect for it too. OH that is a beautiful quilt! 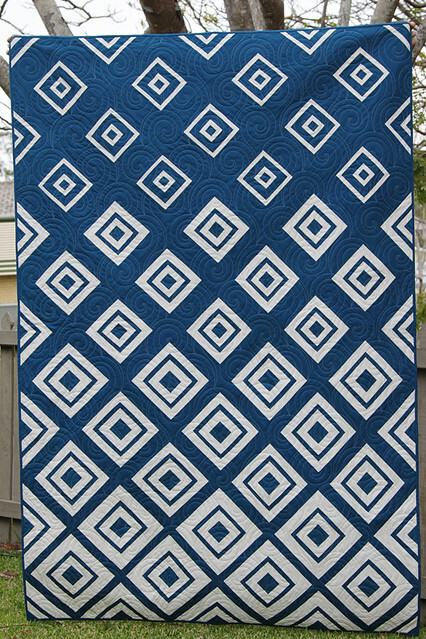 The blue and white are perfect together,… as is the swirling pattern she chose to quilt it with. Wow! My favourite project from all of the finished projects on Crazy Mom Quilts. It’s a stunner! Wow. I love your quilt. The colors you chose are delightful together and the pattern is terrific. AWESOME! (ENOUGH SAID!) Thanks for linking to TGIFF! What an absolutely gorgeous finish! The quilting is such a compliment to the design. Bravo! Ohmigosh, that is just too stunning for words! I love this, it is superb! Well done! WOW! Seriously WOW! This quilt is amazeballs! It’s just so fabulous. Well done. Love! Thank you for commenting on my blog a little while ago. It’s been a crazy few weeks and I finally have time to catch up on blog reading. I’m so glad I stopped by your blog today. Your quilts are just beautiful…works of art. Absolutely stunning … truly covetable … and yes, very reminiscent of the deepest blue seas. I’m just finishing off some dyeing … squares of boiled wool that I’m rather vague about what they’re destined for! This is strikingly beautiful. I am so scrappy, I would have never envisioned 2 colors that shine so well. Love eveything about this! Is this your own design or a pettern you purchased? I just saw this posted on Pinterest and followed the pin all the way to this gorgeous site. 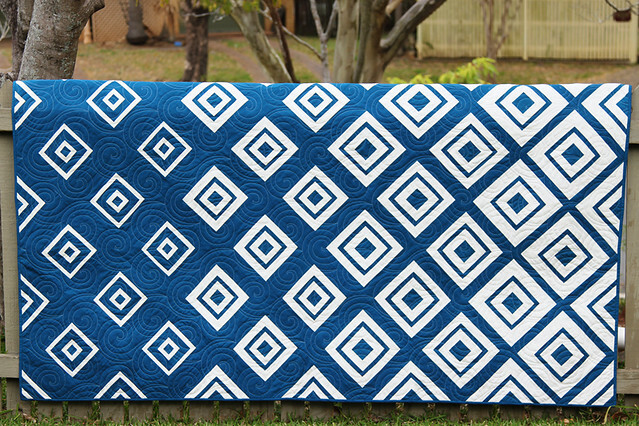 I’ve just purchased the pattern here and have the most beautiful aqua batik fabric in mind for this beautiful quilt! Thank you! from Tracy in St. Louis, MO – USA! love this quilt and that it is log cabin. would be nice to see a diagram. I am new to quilting and don’t know if I would remember how it is done. when to change colours etc. OMG, what a STUNNING quilt & color choice! This will be a must on my long to do list… and may very well be pushed to the very top of that list! It is lovely. Unfortunately I can’t do that. I’m a crocheter. So I would like to ask if you allow me to try to figure out this pattern with yarn. Thank for the inspiration.